The "early May" release of Android 1.5 has become "early June," with a recent announcement from T-Mobile. The G1 Community forum received a message yesterday that said, "We are working diligently to get Android 1.5 out as soon as possible, while aiming to ensure a consistent, positive experience for our customers. We're finalizing the build this week to ensure optimal functionality and smooth delivery. Therefore, the rollout schedule has been reset by approximately a week, and we expect all G1 customers will have the update by early June." By the time the OS update better known as "Cupcake" is released over the air, it will have been on the public's radar for more than six months; and its features are well-known and well-desired (only now a bit more impatiently). Cupcake promises an update to both the Linux kernel and the Webkit rendering engine, which will vastly improve Android's speed. 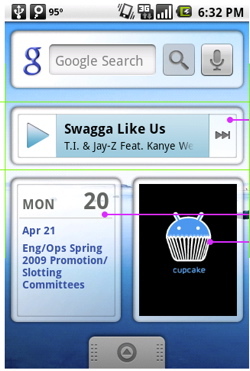 In addition to adding video recording and a soft keyboard, one of the major attractions of Android 1.5 is the introduction of widgets, or small applications that run directly from the home screen. Since developers have had their hands on the updated SDK for several months, and the guidelines for Widget creation have been laid down, maybe another week will ensure that Cupcake launches with a goodly amount of supported widgets for users to download.